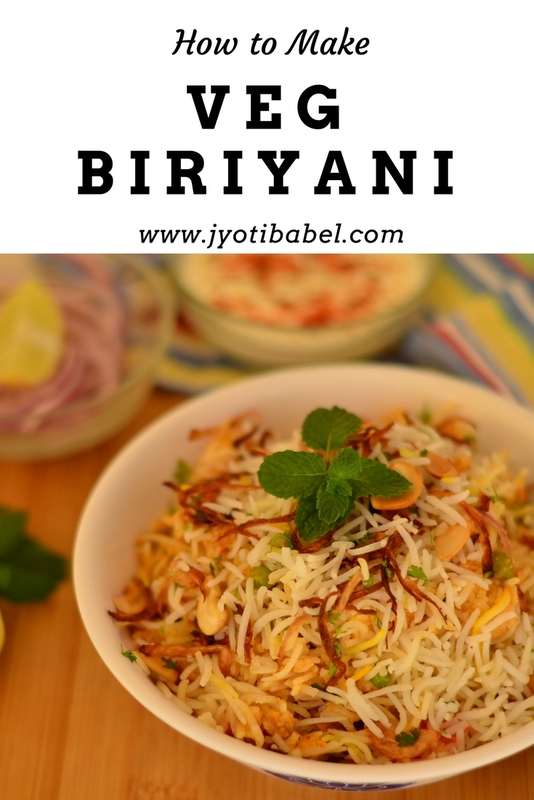 Biryani is a flavourful, spicy and aromatic rice dish that is much loved in India. This is one dish that is said to have found its roots in India during the Mughal rule. There are many versions of Biryani in India like Awadhi Biryani, Hyderabadi Biryani, etc.. While non-vegetarian Biryanis are more famous, vegetarians like me can indulge in veg biryani like the one I am sharing today. Making Biryani at home from scratch was a dream for me. Reading all the recipes online made it look so daunting and time-consuming that, for a long long time I didn't even give making it from scratch a thought. And, it is a fact that making a pot of biryani at home is a time-consuming process. But, once you have made the perfect biryani on your own, the feeling you will experience will be no less than that of conquering a battle. Period. When I make it at home, I just wholeheartedly make this. 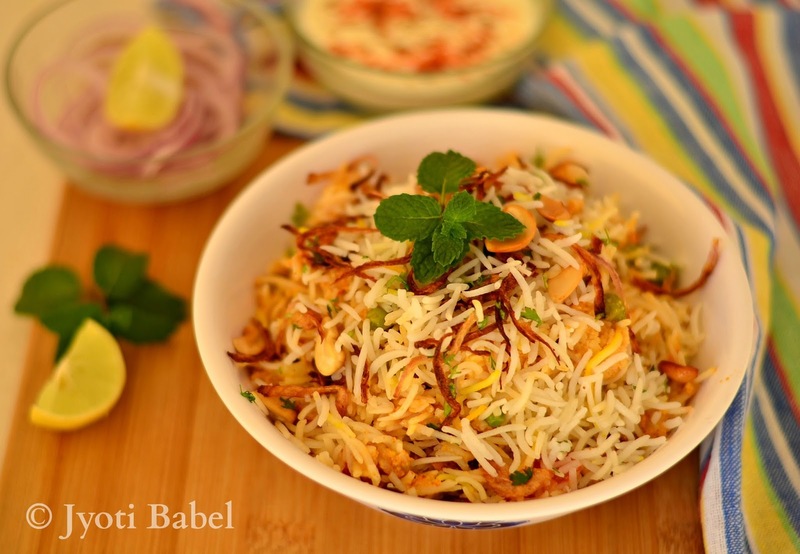 There are 2 reasons - one is that it will take about 1½ to 2 hours to make biryani from scratch. Gathering all the ingredients, cooking rice, preparing gravy, preparing fresh herbs for layers and onion crisps for topping - there is quite a lot to do. I don't have more than that much time to prepare a onetime meal. Secondly, I do not want to diminish my appetite by having some snacks before having biryani. Trust me on this - a biryani tastes best when you are really hungry! A heap of homemade biryani, raita and some onion slices - that's enough for a hearty and filling meal. Read the recipe several times before starting out. Get all the steps clear in your mind. Check if you have all the ingredients handy in your pantry. Lastly, make it when you have at least 3 leisure hours at hand. You can't make a good biryani in a hurry! Making good biryani has its own learning curve. You have to make it a couple of times to get the hang of getting it perfect every time. The first time I made it, I largely followed this recipe. In my next several attempts, I made my own additions and changes to bring you this recipe today. Do check the notes for some extra tips. I must add here this was the first thing I shot to share on the blog after the long blogging break I took after having my baby. It was already evening by the time this biryani was ready and baby M was taking a nap. On an impulse, I set the dish and took out my camera and clicked away! Without much ado, let's hop over to the recipe of veg biriyani now. 10 saffron strands soaked in 1 tsp milk and rubbed in a pestle mortar. 1. Thoroughly wash and drain the rice. Soak it in fresh water for about half an hour. 2. Boil about 8 cups of water in a large vessel to cook the rice. When the water comes to a boil, add all the whole spices. Drain water from the soaked rice and add the rice to the boiling water. Cook the rice uncovered till they are half cooked. 3. When about half cooked, drain the rice in a colander and pour cold water over it to stop the process of cooking. When all the water is drained, pour the ghee over the rice. 4. Take about ½ cup of cooked rice and add rubbed saffron to it. Keep it separately until needed. 1. In a pressure cooker, add the chopped veggies. Add about 1 cup water and cooked it for 1 whistle. Switch off the gas immediately and put the cooker under running tap water to cool it down. Open and drain the veggies. Reserve the water in which the veggies were cooked. Alternately, you can half cook the veggies in a pan of boiling water. 2. Soak the cashew, khus khus for half an hour in warm water. Grind it into a smooth paste using little water. Keep aside. 3. In a large pan or Khadai heat oil. Add the bay leaf, asafetida, cloves, cardamom, cinnamon and sauté for 30 seconds. Add the chopped chillies, ginger and garlic paste. Add cashew nut half and fry them till light brown and toasted. Stir and add the onion paste. Fry the paste for 5-7 minutes, till it starts looking brown. 4. When onion paste looks cooked add cashew and khus paste. Stir and cook for 2 minutes and add pureed tomatoes. Stir well and cook for 5-7 minutes. 5. Take the pan away from heat and add the beaten yoghurt and still constantly to prevent the gravy from curdling. Take the pan back on heat and add rest of the spices. Stir and now add the half cooked veggies and paneer pieces. Add the reserved vegetable stock, stir and cover the pan. Cook on low heat for about 10 minutes. When done, oil will separate from the sides of the gravy. Set aside. 1. Peel the onion and cut into 2 halves. Slice them very thin. 2. Heat oil in a Kadhai for frying the onions. Fry them in batches till they are dark brown and crisp; do not overcrowd the Kadhai. Drain the fried onion on paper towel. You can make these fried onions in advance. When all these things are ready, you are ready to layer the biryani. (See Notes) Take a large baking dish and depending on its depth, you can go for 2 or more layers. Grease the dish and add 1/4th of the rice followed by chopped coriander and mint. Add ½ of the gravy followed by rice, coriander, mint again. Add rice followed by rest of the gravy. Top it with remaining rice. Sprinkle the reserved saffron rice on top and drizzle ghee over the rice. Cover the baking dish with an aluminium foil and bake in an oven preheated at 180 C for 15 to 20 minutes. Turn the oven off, and let the biryani sit in the hot oven another 10 minutes. When serving the biryani, top with the fried onions. Serve it hot with raita or yoghurt. 1. It just takes a few minutes for half cooked rice to get fully cooked, so keep an eye. Overcooked rice will give a mushy and stick biryani. The rice should have a slight crunch. 2. Adding whole spices while cooking rice makes them more fragrant. 3. I cook the veggies in a pressure cooker to make the process faster. However, if you are sceptic about putting a hot cooker under cold tap water, cook the veggies in a pan of boiling water till they are half cooked. 4. I like to have 2-3 layers in my biryani. However, if you like you can place 1/2 of the rice, then the entire gravy and top it again with rice. 5. It is best to keep everything ready and layer the biryani about an hour before serving. The chopped fresh mint in the layering tends to go bitter if left for longer. If you need to layer in advance, I suggest skipping the mint entirely in layers. You can, however, use mint as garnish right before serving. 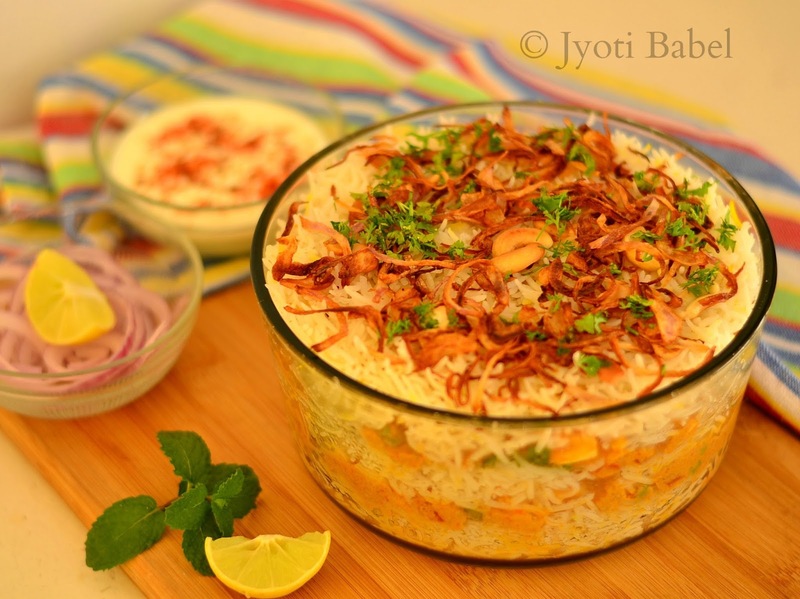 You can also check out this Sweet Pineapple Raita recipe that goes very well with Veg Biryani.